Argentine Tango Competition - Single Dances, Championship & Cash Scholarships- Tango Salon, Vals, Milonga, Tango Nuevo, Tango Show, and Jack and Jill. Have fun participating at this thrilling tango competition, and take your tango to the next level. This Tango competition is another great way to play with this dance. Traditional, Salon, Vals, Milonga…you pick. Like stage tango? Enter on Showdance. Non traditional? Tango Nuevo. No partner? Enter on Jack & Jill. “Open Tango Salon Scholarship” will award the winner couple with 30% of the total accumulated fees for this competition. The DC Tango Challenge has the goal to motivate dancers to continue improving their Argentine Tango dance in all areas, and offers many options to entertain any type of tango dancer. It consists of a set of competitive amateur, pro/am and open events, open to all dancers to participate. The participants can choose to compete in single dances competition such as Tango Salon/de Pista, Vals, Milonga, Tango Nuevo, & Tango Showdance. The competitors can choose to compete also in a 3-Dance Challenge, Tango Salon/de Pista Scholarship and “Jack & Jill” Tango events. 6:30PM to 8:00PM – Pro/AM, & Amateur Single Dances – Tango Dance Competition. 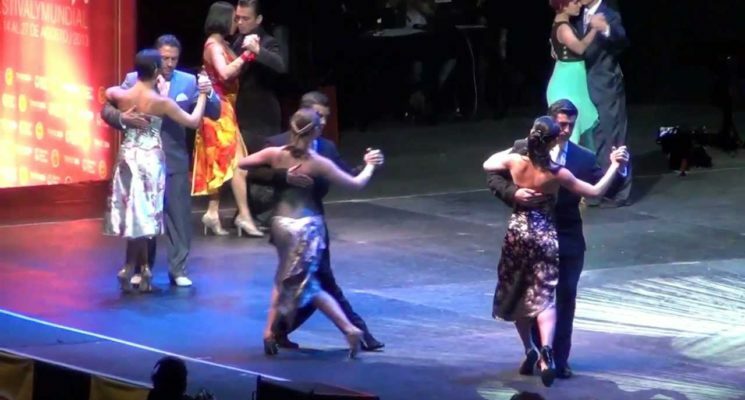 8:00 PM – Argentine Tango Showdance (Stage Tango) Competition. Admission tickets to Friday “Welcome” Milonga and Dance Entry will be required for the competitors. DEADLINE FOR ENTRIES – 01/31/2019. To complete Enrollment please read “Rules & Guidelines”, print “Entry Form & Release Agreement” and “Accounting Summary Form”. Fill them out, and send to Forever Dancing Ballroom, 5818 Seminary Rd. Suite B, Falls Church, VA, 22041 , with a check written to Forever Dancing LLC. You will receive a confirmation e-mail once we process your registration. Click on the Flier Below, Print or Share with some friends to invite them to play with us.